So is Roger Clemens Guilty or Not? Dang it baseball! I grew up loving this “Great American Pastime”. Every night after school I’d beg my dad to take me out to play catch until the sun went down. Grounders, Pop-Flys, dives in to the seats (or bushes in my case), the hard line drive – Dad had me act out all the possible scenarios except one – the steriod one. Now baseball seems to be getting some bad PR: from the Barry Bonds binge on the “cream” to Jose Canseco making money by ratting on everyone, many fans like me have a hard time wondering who isn’t on some kind of performance enhancer. 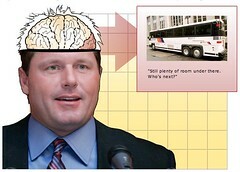 The other day I watched parts of the Roger Clemens and Brian McNamee hearing, which was a waste of time. It made me so mad to know that one of those guys is straight up lying to everyone, including himself. How can this happen? What are these guys thinking? I don’t know enough about the entire story to take a big stand either way, but I really hope for baseball’s sake that Roger is being honest. He’s been a Cy Young Award winner. A World Series star. And now, even if he’s not convicted, people will label him as part of the “Doping Era”. Keep your customers happy: “The Rocket” has done this for many years. The question is now, did he do it legitimately or not? DonÃ¢â‚¬â„¢t screw ex-employees: BZZZ! Pardon the language here but it doesn’t look too good for Clemens or McNamee on this one. Someone is screwing someone in the Clemens/McNamee trial! DonÃ¢â‚¬â„¢t screw partners: Weren’t Clemens and McNamee really close friends at one time? In the world of business and business partnerships, the Golden Rule still applies. If you want someone to take care of you and help your business grow, you better treat them the way you’d like to be treated. Admit your wrongs Ã¢â‚¬â€œ through the proper channels: I skipped going in to any detail on the prior two because this one by far takes the cake – one of these guys is completely wrong. It’s time they cut to the chase and just be honest. In online marketing, there are times when we all make mistakes. The best companies acknowledge those mistakes and do the best they can to resolve the problem. By going the extra mile with clients, even if the experience wasn’t a perfect one, you’ll generally leave a positive impression on the people you work with. Keep these things in mind as you continue to build your prospective businesses. The sooner you start protecting and building your brand, the better off you’ll be in the long run. Nice comparison with the Rocket and brand management. Good creative thinking. Waste of time instead of waist of time? Enjoyed the article. P.S. You must have had a really good dad who spent a lot of quality time with you. Isn’t it interesting how the golden rule and sound principles and ethics apply to practically every area of life, whether baseball or eCommerce? Thanks for the reminder! He was a great pitcher and then his career was over. Then he became an even better pitcher than he had been when in his prime. And the way he answered questions leaves little doubt he had to parse his words. Truth flows out of the mouth easily. Obfuscation takes effort and that’s what we saw. There is no doubt the man is guilty of using products to recreate his career. Any other conclusion is marketing. Obviously this is assuming he is guilty. As the cliche goes, “Honesty is the best policy.” Thanks for the comments. It is so important to be more interested in integrity than making a buck. That’s why we must run our companies on the “up and up”. I don’t think the customer is ALWAYS right, or that you should lay belly-up everytime a customer complains, but you do want to give the benefit of the doubt most of the time. I liked the analogy! We here so many stories about selfishness, greed, betrayal and dishonesty that they seem to be the norm. I believe that most of us do the best we can, and I think the main thing is to treat people the way you would like to be treated and if you do stuff up then own up and do what you can to rectify it.